Does the headline make any sense to you? It makes perfect sense to me, but perhaps not to people that don't know Japanese racing. Nissan/Nismo has been running a V-8 powered GT-R in Japanese Super GT Racing GT500(500 hp) class, and a Nissan Z33 in the GT300 (300hp)class. 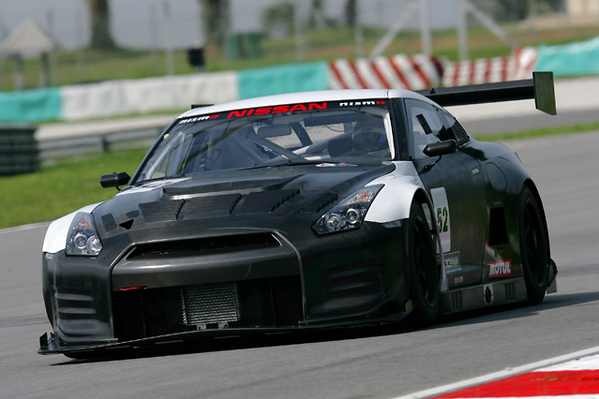 For 2012 Nissan is going to be racing a rear wheel drive GT3 spec Nissan GT-R. The Nissan GT-R will have a VR38DETT, restricted to 300 hp. Nissan will field only one GT-R Nismo GT3 in the GT300 class of the 2012 Super GT season, with the car being run by the Nissan Driver Development Program team, which is headed by Masahiro Hasemi and includes up-and-coming drivers Yuhi Sekiguchi and Katsumasa Chiyo. March 31, 2012 is the first race of the season, at Okayama. Head over to the Super GT site for lots of information, in Japanese.